"This product is quite amazing actually. Within 30 seconds of scale work my hand felt nice and loose as I began warming up. This is an essential tool for anyone on the go with the need to keep their chops up. Also great for warmup before a performance without the need of an actual guitar!" PocketString's 6-fret model, with a 1.75" nut width, is perfect for the guitarist that wants to practice scales with a super portable practice tool that fits almost anywhere. 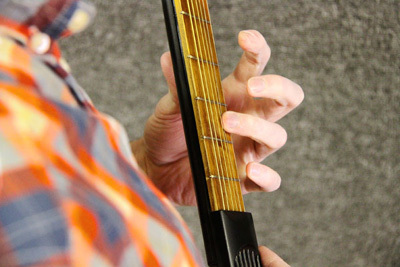 6 real frets, customized wood, raised strum pad to simulate strumming, durable, sleek design, and extremely portable. PocketString's allows you to practice and improve your guitar skills in guitar-unfriendly spots such as: cars, airplanes, the office, school, dinner table, and virtually any other place your pocket will fit, but your guitar won't. PocketString's is durable and engineered to last. It comes with real strings to help build finger strength and calluses while practicing your favorite guitar jams. Cover slides open for easy practicing! Comes with steel strings, but nylon ball ends strings can be substituted and purchased separately.